Libya’s “smuggler king,” who reportedly has links with human traffickers, has a Maltese-registered company and owns a ship that operates out of Malta, according to a report in the Asian Times. “While he is not directly involved with human smuggling currently, locals say that he works with some of the human smugglers in other illegal ventures.” The report claims that Fahmi Slim is involved in fuel-smuggling activities in Libya and is known to French, Maltese and Italian authorities as a person of interest. The company Fahmi Slim is partner in has been named as ADJ Trading Ltd. Research carried out by The Malta Independent shows that the general trading company is registered at an address in Mensija Street, San Gwann. The other two shareholders are Egyptian Ahmed Irahim Hassan Ahmed Arafa and former national football team player Darren Debono, 41, from San Gwann. A search in the court databases shows that Mr Debono was twice given suspended jail sentences by the courts; once for stealing a refrigerated trailer for storing fish (he owned a fish shop in San Gwann) and the second time for under-declaring fish landings at the Customs Department on some six occasions. The charges in the second case included defrauding the government. The name of the Egyptian shareholder, as well as Darren Debono’s, appears in another court case where they claimed he had no knowledge that a fishing vessel they had chartered had being used to smuggle cigarettes into Malta. The Malta Independent could not find contact details for ADJ Trading Ltd, formerly named ADJ Saltfish Ltd. In the meantime, the Asia Times report speaks of a group of interlinked crime families – similar to the Italian Mafia, families and including ties to them – handles human trafficking, diesel smuggling, drug smuggling and weapons importation. It quotes Libyans saying that the EU is only interested in stopping migrant trading but not caring about drug, fuel and weapon smuggling, which keeps fueling the unrest in Libya. The fact that “Zwara’s smuggling king” is a shareholder and director of a Malta company is proof that the EU is turning a blind eye on smuggling. Except for human smuggling, that is. Fahmi Slim, the report says, has now also acquired another tanker, the Tioboda 1, formerly named Troodos. 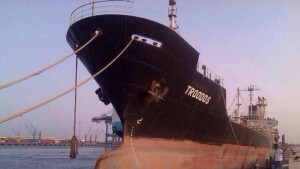 Documents from the Lebanese port authorities seem to show that the derelict tanker (it had been moored in Misurata for a number of years before being acquired by Fahmi Slim) was towed to Malta where it underwent a refit. The author argues that if the WU wanted to put pressure on those who have the power to stop human trafficking in Zuwara, Fahmi Slim would be an excellent place to begin. “Why was the ship allowed in Maltese waters? Why is the Maltese company allowed to do business,” she asks.